It seems rather curious to be celebrating the Solemnity of Joseph, the husband of Mary, during the season of Lent. After all, by the time Jesus was well into his public ministry, and most especially by the time he was about to undergo his passion and death, tradition has it that Joseph had already died. Even our Gospel reading today seems a little out of place. It seems better read during the expectant days of Advent than in the more somber Lenten Season. Joseph, whom the gospel refers to as a “righteous man”, discovers that Mary, the woman betrothed to him, is with child. The problem is, they have not had any sexual relations with each other. Now in Jewish Law, a man already had legal rights to a woman to whom he was betrothed, even if they were not actually married yet. Hence, if found pregnant by another man, Mary could be put to death, as this was stipulated by the Mosaic Law. Joseph thus finds himself in a bind. Being a “righteous man”, he wishes to show loyalty and kindness to Mary, while at the same time satisfy the requirements of the Law not to approve adultery. So as the gospel reading tells us, Joseph decides that in order not “to put Mary to shame”, he would just divorce her quietly. However, Joseph’s human calculations are cut short by a sudden divine intervention. 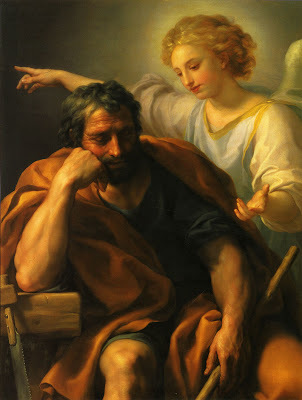 He sees an angel in his dream who tells him not to fear to take Mary as his wife, for it is all part of God’s promised plan for the salvation for his people. And Joseph, just man that we was, did as the angel had told him. The story of Joseph is our story as well. How many occasions have arisen in our lives as individuals, when in spite of our best efforts, we suddenly encounter seeming dead-ends, seemingly unresolvable dilemmas, insurmountable problems, sometimes even the absence of sense and meaning? And these occasions arise even if, most of the time, we are “doing our best”. Moreover, in our lives as Christians, and in the life of the Church as well, moments like these come up: when because of our convictions, we find ourselves holding the minority opinion, when because of our sincere efforts to live our faith, we find ourselves ridiculed and even silenced by a world bent on making itself heard. It is at such moments when the message of the gospel reading, as well as the two other readings, for today’s solemnity becomes truly relevant, in Advent, in Lent, and in every single day of the year. In both the first and second readings, we hear of God’s promise of his continuing presence and concern for Abraham’s descendants and to David’s as well. It is this same promise that we see operating in the life of Joseph. Joseph, a just man, faced with a serious difficulty, held on to his faith, and believed that God’s plan, mysterious as this might be at times, always works out for the best, for those who trust in God’s promise. As Joseph believed, so must we. And it is this promise and the trust that Joseph put in it that we celebrate today. Last December, I had the opportunity to get together for a couple of hours, with some of my former students who have since been ordained to the priesthood. It was a great joy to once again be with these young men with whom I lived and worked in seminary a number of years ago, journeyed in philosophy classes, talked and argued, at times for hours, about life, faith, vocation, and the direction God wanted for them in their lives. It was an amazing experience see the grace of God at work so powerfully in their lives, they who have been asked to give up a lot of things but who have also been blessed with so much joy, happiness, strength and fulfillment that only a life lived in total trust and abandonment to God's promise can bring. I’d rather believe that Joseph, when he was about to take Mary as his wife, was a relatively young man, not much older than some of my newly-ordained students perhaps. Joseph was most likely a young man, who wasn’t rich, but wasn’t poor either—carpentry was a lucrative business back then. He must have been a decent, presentable, young man with a lot of personality, and most likely, dreams and hopes for himself, Mary, and the family he wanted to create. But God had other plans for Joseph, for Mary, and for the son she was going to bear. It would not be easy—for he wouldn’t exactly be his son. But Joseph was willing to give himself to God’s plan nevertheless. And he gave himself to it completely. He took that "leap of faith", then never looked back. There can be no greater joy and fulfillment in life than to know that the gifts one has been given will be used in an enterprise larger than ourself—an enterprise that has been around long before we existed, and will continue, long after all of us are gone. For those of us in the ministry, and those seeking to follow closely in Christ’s footsteps, it is good to pause every once in a while and ask, What offering can I make? Joseph offered his whole life? What have you got to give? Is it your talents, intelligence, enthusiasm for ministry? Is it your fine personality and the fact that people listen to you? Whatever it may be, know that it was given to you for one purpose—to use it to further God’s work of salvation. Give yourselves to the Lord, then. Do not hesitate; do not waver. Like Joseph, trust in God’s promise. Say ‘yes’ to his plan. Say ‘yes’ to your calling. Like Joseph, take that "leap of faith", and never look back. You won't regret it.